Electric buses have been tested on Bangkok routes, but the Bangkok Mass Transit Authority (BMTA) never has committed to employing them. 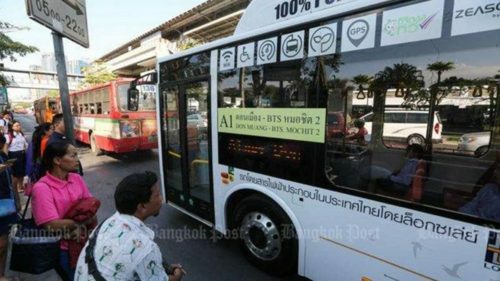 The Democrat Party rolled out its policy platform Sunday, aimed at upgrading Bangkok residents' quality of life, including a smart bus project to push for 5,000 electric buses in seven years, making Bangkok a world-class tourist spot and promoting clean and well-organised food stalls. Democrat leader Abhisit Vejjajiva said the policies are not pipe dreams but are based on feedback the party gathered from city residents. "The party has come up with these policies because we understand the lifestyle of Bangkok residents. These policies are not castles in the air, but we have gathered the needs and problems facing people in Bangkok,'' Mr Abhisit said. "Bangkok must be liveable, beautiful and clean. It must be a city of opportunities and a safe place to live,'' Mr Abhisit said. The policies include a smart bus project to provide Bangkok commuters with 5,000 electric buses in seven years. The party also has a policy to subsidise privately owned bus operators on the condition they do not increase bus fares. Another policy is to promote "smart taxis'' by legalising drivers who use personal cars to provide services via ride-hailing mobile apps and making it easy to obtain public transport licences, Mr Abhisit said.